There is still a very understandable mixed sentiment towards U.K. equities. Prime Minister Theresa May was dealt another blow yesterday as she won’t be allowed to present the same deal to Parliament for a third time. A delay increasingly seems the most likely outcome, though it’s anyone’s guess of how long a wait we’re in for. And yet, amid the uncertainty, more voices have been rising in favor of British stocks. With a clear outperformance of domestic shares since January, it’s fair to wonder what’s left to play, especially with the pound lacking momentum. Generally speaking, investors were receptive to the idea that U.K. tail risks have receded, Berenberg strategists wrote in a note published yesterday, citing the expectations that outcomes including a hard Brexit and a Corbyn government are less likely. Taking into account that the U.K. economy is seen as being fundamentally in good shape, the country can look appealing, they said. 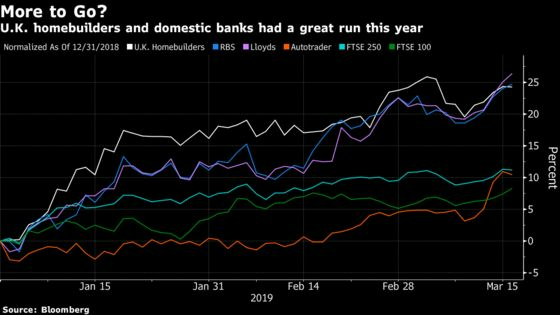 JPMorgan strategists continue to find U.K. domestic names attractive. They base their view on valuation and leverage grounds, highlighting that since 2011, the leverage of their domestic basket has come down by 16%, while FTSE 100 leverage has increased by 43%. They name Lloyds, Persimmon, Land Securities and Barratt as particularly attractive plays. The view on domestic stocks is shared by Aruna Karunathilake, Fidelity International U.K. Select Fund Portfolio Manager. It’s "time to be brave" and buy undervalued U.K. domestic stocks after investors shunned them because of Brexit, she wrote, listing Autotrader and Lloyds as examples of market leaders trading at a significant discount to international peers. Karunathilake added that the view on U.K. stocks was now close to the point of "maximum fear," and preferred to stick to fundamentals rather than trying to guess the next twists and turns of the macro environment. By contrast, the view on exporters is still fairly negative. JPMorgan strategists anticipate the pound will rise further this year, which will weigh on the FTSE 100. This relatively bleak picture for exporters is "confirmed" by a lack of technical momentum in the FTSE 100 futures. 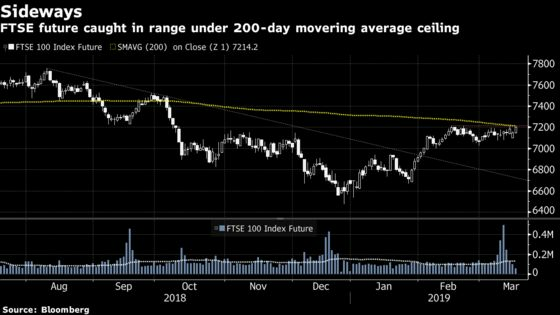 The contract has been consolidating below its 200-day moving average over the past month and has so far failed to breakout. On the other hand, the cash index broke its 200-day moving average yesterday as the pound dropped. What’s next then? Citi strategists raise a good point: highlighting that if a deal was to be agreed on within the next few months, the option to reverse Brexit would be gone, but it would be unlikely to lift the uncertainty. In fact, negotiations about long-term trade relations with the EU have not even started, so economic uncertainty and political tensions would remain very high, they concluded. Ahead of the open, the pound has brushed off yesterday’s news, recouped losses and Euro Stoxx futures are trading up 0.1%. 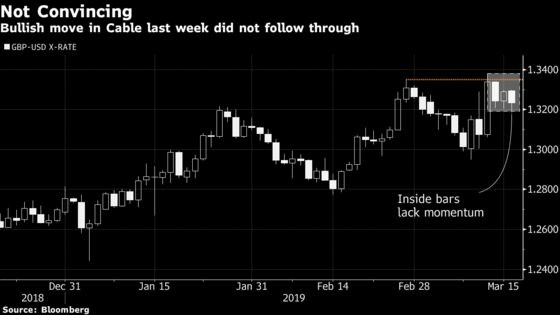 Watch the pound and U.K. stocks as Prime Minister Theresa May looked set to seek a long extension to the U.K.’s European Union membership after the House of Commons speaker torpedoed her plan to win Parliamentary approval for her deal to leave the bloc. Watch French banks after the country’s high -- and rising -- private debt burden has worried regulators enough that they are forcing banks to put aside more capital to support lending in a downturn. Watch IPOs staging a comeback with Ride-hailing giant Lyft aims to raise as much as $2.1 billion in its U.S. listing, while Italian payments firm Nexi is targeting a Milan IPO of up to 2.7 billion euros. Twelve other companies set terms for their offerings Monday, including Precision Biosciences and Tufin Software Technologies, the data show. Morgan Stanley says Informa can look ahead to a better remainder of 2019, with the UBM merger boosting margins, upgrading shares to overweight from equal-weight, price target 840p. The bank says the company looks lowly rated versus peers. Citi upgrades Hikma to buy, saying the FTSE 100 member deserves to trade at a premium to the EU pharma industry and U.S. generics, given its superior growth. Citi’s earnings estimates beyond 2021 are 15%-60% ahead of consensus. Morgan Stanley set Experian at underweight, with “punchy” valuation prompting call to take profits. The broker said stock has outperformed peers by about 30% over past year, but EPS is only up 5% on relative basis; “valuation has run ahead of fundamentals” and additional outperformance needs upgrades.